Looking to launch your hotel website? Thinking of a renovation for your travel agency site? 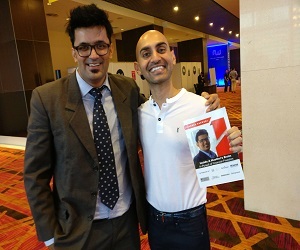 Mooting a makeover for your traveler blog? Do not go far. What you seek is right here, a little below. Scroll down your mouse a few inches and you will come across a collection of 45 WordPress magazine travel themes. These templates are ideal for all the purposes that we have mentioned above and much more. Though they go by the name of WordPress magazine themes for travel sites, they can also go with portfolios, blogs and eCommerce platforms dedicated to travel, adventure and exploration. You know how flexible and versatile the open source software-WordPress is. Its templates are also the same and give you complete liberty to customize and extend the functionality of the templates. In case you are thinking you will have to learn coding and some amount of programming to use these themes, you are wrong. These travel themes of WordPress are perfectly fit for any amateur as they come with complete documentation. You can also utilize the customer support available along with these premium themes to get desirable results. It is very simple. So, check out the collection and catch the right pair for your web platform. You are sure to find it here. All the sightseeing spots of the world would get best showcase with theWorld. This minimal magazine theme comes with gorgeous and fresh design. Its mega menu, custom widgets, shortcodes, featured slider and other features are fit for your travel magazine site and you will have a fantastic time with it. Fully responsive, fast and SEO optimized; Best is an excellent theme for magazine sites. It will display your travel destinations in a very stylish manner and since the template is optimized for AdSense, you can easily make money. The template also carries a review system that will lend more credibility to your web platform. An eye-catching theme, WP-Visual engages your readers with great interest. It focuses on high-quality images and gives the best exhibition to your travel destinations. Your magazine travel site would make a very sound impact if you decide to go with WP-Visual. Say hello to PlayMag, a modern and clean Magazine WordPress theme packed with latest features and carrying trendy design. The template is very contemporary and gives you an in-built review system along with many other smart attributes. It will perfectly complement your magazine site and you can get best results at a cost-effective price. MagXP is a very powerful Magazine WordPress theme that will make your day. Its multiple layouts, fully customizable framework, integrated review system, unlimited sidebars and other features are well equipped to serve your purpose. This MyThemeShop gift is perfect for your travel site. A fully featured theme, Fraction is a fabulous theme with its own Banner system. The template is known for its brilliance and can go with any style of site. Your travel magazine site will get an ideal partner in its form and the template will bring you desirable results very quickly. NewsWorld is a modern WordPress magazine theme that presents your content in such a way that your readers can easily access it. This template is SEO optimized and speedy with all the contemporary features. All its elements are pixel-perfect and thus, give pleasant packaging to your images and videos. Carrying powerful features and content-centric approach, Neuton is a modern WordPress News/Magazine theme. It focuses a great deal on your audience and adapts perfectly to any screen size. The outstanding design along with responsive and customizable layout give you great support and you can easily tweak the features to suit your taste. Exuding qualitative brilliance, BlogSpring is a great theme for your travel magazine. It gives topmost priority to your content and you can publish your articles, updates and other things without any problem. The theme is a real gem and a must-have. A modern and feature-rich theme, Adventure comes with a full width featured slideshow for displaying your most important articles. The template is super ideal for your travel magazine and gives best exposure to your web platform. This OrganicThemes product is worthy of investment in every way and therefore, do check it out. A content-centric theme with a clean design and ample use of white space, Sharp Magazine lets your content do all the talking on all viewing devices. A result of meticulous research, this template gives you best service without extracting much of a price. A modern magazine WordPress theme with great ability to handle a huge amount of content, Neu is ideal for web publishers who deliver regular topic-centered content. Your travel magazine would do very well with it for here you get visually appealing design and advanced features; both at the same place. Made to empower the users, Novelti is a bold News/Magazine WordPress theme. It gives a new cool and modern look to your site along with awesome usability. The template is a great investment option as it has all the necessary features you need to give your travel magazine a smart and savory look. A complete travel theme, Magellan is fit for portfolios, business sites and blogs. It offers you a modern, bold, sharp design along with many custom options and elements that will help you impress the audience and the search engines in a jiffy. This template will certainly bring you success. New Lotus is a creative Magazine WordPress theme. Gentle and delicate, the template has got everything that will make your travel magazine the center of attraction. This KopaTheme product is very easy to set up and carries multiple features along with easygoing customization alternatives. This is a responsive Blog, Magazine and Review WordPress theme with lots of smart features. It is quite contemporary and carries custom category background, custom post background, 600+ Google fonts, post format support and much more. The template is buzzing with beautiful attributes and all are here to give you the best results at an affordable price. A socially active Magazine theme, Opinions comes with a clean design and strong ability to carry a large amount of content. The template is well aligned with BuddyPress and hence, creating a community site around your travel magazine is a breeze. Buy it, get it activated and you are ready to take off. Meet Monospace- a uniquely designed WordPress theme with a creative design and loads of features. It is fit for content centric-niches with a fine focus on visuals as well. This MyThemeShop offering would be an ideal fit for your travel magazine and you can easily reach your destination in lieu of a fair price. Tailored for news, magazine sites and blogs, TrustMe is a responsive WordPress theme with right amount of features and customization options. It offers you 23 amazing widgets, 4 post formats, 18 widget areas and loads of theme options. Your travel magazine will enjoy great popularity with this ColorTheme product and you will have a fabulous time with it. Based on the new Bootstrap 3, WowMag is a completely responsive WordPress theme with elegant style and rich features. It lays a strong focus on content and readability. This means you can easily get entry into the good books of search engines and audience. Novomag offers you unlimited homepage styles, 2 blog options, Google map, styled contact form, personalized banner system and much more. This template offers you lots of freedom to tailor things your way and you can easily develop your travel magazine in your style. Do check it out. Simple Love is a sweet and easygoing theme that can serve multiple purposes. It is beautiful, clean and modern with all the features that will justify your travel magazine to the hilt. You can bend it as per your will and that too without touching the code. Meant for multiple magazine styles, Stylebook is a Twitter Bootstrap ready theme with a very content friendly approach. This template gives you multiple page layouts, post templates, fully controllable sliders, shortodes, responsive carousel and many more attributes to design your travel magazine. It will certainly wield great results. Now you do not have to worry about the amount of content as Nexus is packed full of custom widgets and content modules that give you control over your page. Its strict grid and clean layout are fit for any style of content and thus, your travel magazine will go great with this ElegantThemes product. Made by OrangeThemes, Forca is a very affluent theme with many groovy features that will serve your purpose to the hilt. The template has many shortcodes, homepage styles, sidebars, review system, 2 blog styles and many more qualities. It will do complete justice to your travel magazine and you can fully rely on it. Open Times is a Magazine WordPress theme with a responsive layout, content friendly attitude and customizable design. This theme makes sure readers get value for time and do not return unimpressed. This KopaTheme product is really a worthy sample, fit for investment. A new and minimal theme, Rexus comes with a modern, elegant design and fully responsive layout. This premium template is ideal for your travel magazine and carries many features that will give you one of the best magazines out there. It performs out of the box and gets ready within moments of installation. A modern Blog/Magazine theme, MagicNews is very efficient and knows its task well. Working with this template is a cakewalk and you will enjoy every moment that you get to spend with it. It is truly magical and also impresses search engines in a jiffy for it has been developed with SEO in mind. Vivance is a modern and feature-rich theme that will make your travel magazine acquire all the limelight in easy steps. It follows the latest trends and gives you a huge arsenal of tools to shape your web platform the way you like. You can add video samples and photo galleries of the travel destinations to add more credence to your site. Here is a feature-rich theme that lets you choose from 5 category templates. Patterns carries the capability to create a truly dynamic website and it has multiple features that are fully sufficient for your travel magazine. Say hello to Material, an elegant and professional news theme fit for your travel magazine in all ways. It can display a lot of content in a clean and user-friendly manner. Its 3-column grid and multiple homepage content outlets have been designed for the same. Designed by KopaTheme, New Maxx is a clean, crisp and well structured theme with a highly content-centric approach. It can handle any kind of media and carries support for images, galleries, audio, video and all types of content elements. A powerhouse of features, Immunity is a magical theme from MyThemeShop. It can serve multiple purposes and here, you will get responsive design, Magazine/Blog layouts, post formats, custom widgets, shortcodes, WooCommerce support and loads of other features. Want to treat your readers to a clean, modern and readable travel magazine? Go for Magma. This ThemesKingdom offering is a perfect candidate bearing all the qualities that will give you the results you have been waiting for so long. EstateMag knows the importance of readers and thus, comes with a modern, responsive design, awesome typography and focus on readability. It is very smooth and performs well on all viewing devices. With this template, your travel magazine will be ready in minutes. Creating a professional and pleasing magazine site is very easy if Nocturn is here to help you out. Its clean, easy to read architecture gives your content king size treatment. So, you can easily get yourself noticed and rise to the top. 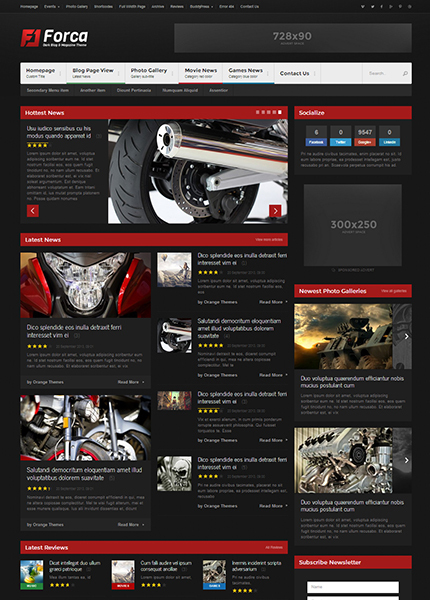 Velocity has been designed to serve magazine or news style websites. Its simplistic styling and wide range of features are enough to build your travel magazine and you will get full support to customize it as well. It also carries the coveted parallax effect and offers, to be a great choice in all ways. Loaded with lots of features, Expedition is dedicated to the travel niche. This Magazine theme knows how to impress readers so that they come back to your site again and again. It lets you be your best and is always by your side. AquaMag is an exclusive, modern and fully responsive magazine WordPress theme. Its features are well-equipped to handle your travel magazine and you will enjoy its company to the hilt. The template has been designed to give you quick and successful results and will live well to your expectations. Go ahead with this simple and friendly theme if you want to create a cool travel magazine. The Mood is a thorough professional, fitted with the right number of features. Its modern Layout, beautiful and elegant colors will complement your web platform very well. Fatima is a fully responsive and professional WordPress blog/magazine theme. Its long list of smart features are clean layout are ideal companions for your magazine and you will have a great time with it. No coding troubles and other teething problems; it promises a super smooth journey. MONT is a clean and cool WordPress theme that will go give your travel magazine the perfect packaging. It focuses heavily on readability and gets installed in simple and easy steps. You are only supposed to get it activated and then it is a smooth ride ahead. Your travel magazine can boast of the best pictures and visuals for Cousteau is quite proficient on this front. It is also responsive and retina ready. Other features are attuned with the modern trends as well and thus, a demo is a must. 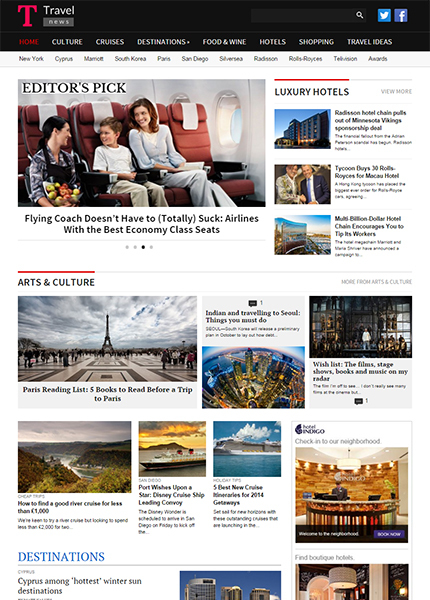 TravelNews is the ultimate magazine theme with right aesthetics and functions. It presents your content in a very appetizing way and makes sure readers get what they want. It is ultra tech-savvy and encapsulates all the latest trends and practices. A pixel perfect news theme, NewsTimes is ultra responsive, fast and SEO optimized. It also carries a built-in review system for writing helpful reviews. The attributes are completely contemporary and cater very effectively to your whims and fancies. I hope you like these WordPress Magazine Themes for travel sites. If you like share more themes with us, do share in comments below. This is the great travel destination presenting Magazine .